Steadily increasing demand for biopharmaceutical drugs has led the industry to examine its manufacturing scales while pressuring research and development groups to produce high-yielding clones and processes. Improved media, feed supplements, bioreactor designs, and control of process parameters have helped biomanufacturers achieve multifold increases in volumetric productivity from production bioreactors. However, cell culture processes are significantly affected by their bioreactor’s ability to support cells at higher densities and sustain cultures at lower viabilities. With the implementation of a number of new approaches, cell densities have been increased from 5–7 × 106 cells/mL to >25 × 106 cells/mL. Such increased densities — and improved specific productivity of the modern clones — has increased productivity as well, with expression titers rising from 1.0 g/L to 5–8 g/L in fed-batch cell culture processes. Moreover, concentrated fed-batch and perfusion cell culture processes have further increased cell density up to >50 × 106 cells/mL, which has further complicated clarification as well as overall downstream processing of recombinant proteins. A high-density cell culture process always poses a challenge to clarification techniques for separating product from cells without compromising its yield or quality. In addition to cell culture processes, clarification and purification techniques are under tremendous pressure to deliver high-quality biological products while controlling cost of goods (CoG). Choice of clarification technique directly affects final-product quality because it paves the way to downstream purification processes that build product quality and ensure product safety. The basic intention of a cell-separation unit operation is to remove whole cells and their components for further processing of a culture’s supernatant. No single technology fits all needs of such applications for all products and processes. The choice of clarification technique varies for different cell densities and viabilities, cell type, culture styles and modes, and harvest viscosities. As cell density and product titer have improved over the past decade, clarification techniques also have improved to meet resulting process and product requirements. We recommend screening all commercially available technologies to understand the best available option for manufacturing of a given biopharmaceutical. We also prefer single-use devices, performing screening studies of high-capacity depth filters as reported herein. The objective of the study described below was to evaluate different single-use technologies and understand the impact of high cell density and lowered viability on existing devices. We challenged different available depth filters with similar feed streams to evaluate and compare their performance. The harvested supernatants of today’s fed-batch processes, with very high cell densities and low viabilities, show increased solid materials such as whole cells, cell debris of different sizes, colloids (lipid components of media and cell walls), nucleic acids, and other particulate matter. Those increased levels can cause early plugging of traditional depth filters. In many cases, multifold increases in filter area are required, leading to poor scalability and expense at manufacturing scale. Traditional primary clarification techniques such as centrifugation, tangential-flow filtration (TFF), and early single-use depth filtration have been used in biomanufacturing to achieve desired quality outputs. They are still integral to many commercial manufacturing processes. However, downstream process engineers are looking for alternatives that can provide more efficient clarification of high-density cultures. Combinations of the familiar techniques have been applied in some cases, depending on the need of the cell culture process and its scale of operations (1). All these techniques — or combinations thereof — have served us at some point. Figure 1 illustrates some combinations of clarification options. Most downstream processes in biopharmaceutical manufacturing include two major categories of technology: chromatography and filtration. The latter includes clarification, virus filtration, and tangential-flow filtration. Clarification process can be separated further into two broad categories: primary recovery and secondary recovery, also referred as primary and secondary clarification steps. The primary step removes the bulk of large particles, whole cells, and cell debris; the secondary step removes smaller particles present in the resulting filtrate. 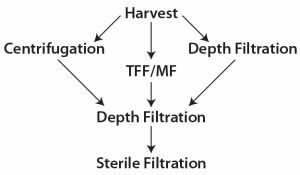 Centrifugation, TFF, and depth filtrations are common choices for primary clarification; depth filtration and bioburden-reduction filters often provide secondary clarification. Tangential-flow microfiltration (TFF-MF) separates particles based on size exclusion using microfiltration membranes with a pore size of ≤0.65 μm. This process is highly efficient for removing whole cell mass and fragments. It provides the most consistent separation by retaining particle sizes larger than the membrane cutoff size. TFF-MF devices also offer advantages for scaling up downstream processing based on modularity. With higher cell densities, however, ruptured and fragmented cells often are observed in recirculation loops, making a secondary clarification necessary to reduce those smaller particles before further downstream processes (e.g., chromatography). High cell density can increase polarization on cell membrane surfaces, leading to frequent filter clogging and complicating manufacturing-scale operations. High-yielding cell culture processes with higher cell densities and specific productivities produce large amounts of solid material (>6%). TFF is best suited for such cultures with solid content <3%. Beyond that, however, TFF becomes inefficient. Centrifugation can be applied to feed streams with high solids levels, concentrating cell mass ≥40% v/v. Product recovery can be low, however, because of increased pellet volumes and high desludging, which are common for cell harvests with very high solids content. Additionally, low cell viability generates particles of different sizes, drastically decreasing their removal efficiency. Although this technique can handle high concentrations of insoluble materials, its ability to produce a clear product is limited. Thus, it often requires the support of secondary filters. In most cases, loading a cleaner material on a column requires depth filtration after centrifugation and before chromatography. The area requirement for such a depth filter would depend on the clarity of the centrifugation output and the amount of suspended material present after primary clarification. Depth filters typically are made of cellulose, with a porous filter aid such as diatomaceous earth (DE) and an ionic charged resin binder. These filters function by retaining particles within their porous matrices. Depth filtration has been a single-use choice for clarification in manufacturing many biopharmaceutical products. Depth-filter pore sizes vary for primary and secondary applications. Different types of depth filters are now available with single or multiple layers and gradient pore distributions. These filters can be applied either directly to whole cell broth (for cleaner output) or used in two stages: primary depth filters to remove larger particles, followed by secondary depth filters to remove finer suspended particles. Depth filters fit well with the emerging trend of single-use technology, making them our primary choice as a single-use clarification solution in biopharmaceutical development. With the advancement of single-use technology, primary and secondary filters are merged into one single step that reduces cycle times and required filter area for efficient clarification. Furthermore, lower buffer volumes are required for flushing in modern processes, enabling improved economics for clarification of high-density cell cultures. Finally, hardware requirements for depth filtration at higher scale are simple and highly flexible, which makes depth filters an attractive choice as a single-use clarification technique. Key features needed for a filter to qualify its use from laboratory scale through pilot to commercial scale are high capacity with minimal area, low cost, consistent performance, high product quality and yield, scale-up ease and flexibility, and a small overall footprint for efficient use of space in a biomanufacturing facility. For evaluation of existing depth filters and other improved technologies, we divided our experiments into two phases. In phase 1, we obtained and evaluated available depth filters and additives capable of handling higher cell densities from different vendors. Filters were challenged with ~28 × 106 cells/mL of cell culture harvest having ~75% cell viability. We analyzed the performance of all filters to select a few best candidates for our phase 2 study. Then, we challenged those shortlisted filters with a bit lower cell density (~24 × 106 cells/mL) and even lower viability ~65%. Phase 2 was meant to study reproducibility and robustness of filter performance with some variation in an upstream process. In most bioprocess applications using depth filters, flow rate in relation to membrane cross-section area has been found to affect process capacity significantly (1). It’s now known that the increased flux reduces the capacity of a membrane (L/m2) (1). Therefore, to achieve acceptable depth-filter performance, we applied a constant flow method. This keeps flux throughout a process, during which pressure and turbidity are monitored until they reach their maximum allowable operating limits. We used different endpoints for each filter, as specified and recommended by its supplier. Finally, we compared data from all experiments and interpreted them to determine the best-suited depth filtration technique for our process. In our phase 1 study, we evaluated depth filters from four suppliers — Pall Life Sciences, Sartorius Stedim Biotech, MilliporeSigma, and 3M — with different pore sizes and multiple layers or both. Each filter was tested for its ability to reduce turbidity to a desired level: <15 NTU, preferably <10 NTU. We used a LaMotte turbidity meter throughout this experiment to measure sample turbidity. We also compared an alternative clarification technology: flocculation, which relies on aggregation of particles for easier separation. In this method, a cationic polymer is added to harvested supernatant to trigger floccule formation. The polymer binds to whole cells, cell debris, and other components, then attracts other nearby components by the van der Waals force to form aggregates of varied size and density. We tested this method along with depth filters of different pore sizes as recommended by their vendors. The polymer dose varies from harvest to harvest, and it’s important to determine the optimum concentration of flocculant for each cell culture process. To determine an appropriate concentration, we added an increasing volume of flocculant solution to a constant volume of harvest, checking all samples to determine which reached the lowest turbidity. We thus considered the concentration at which the sample showed lowest turbidity to be the optimum flocculant concentration for filtration. Then we challenged a harvest with this optimum concentration further using depth filters of different pore size to discover the best-performing depth filter. Finally, we evaluated another technology: addition of diatomaceous earth (DE) powder to harvested supernatant before filtration. This technique increases the surface area of a depth filter by making a porous cake of DE over it. In normal depth filtration, a filter cake forms on the surface of a filter and clogs its available surface area. But with DE added, it forms a permeable layer over the filter, which increases its depth and surface area for filtration. The porous layer traps whole cells and debris through both adsorption and sieving to yield a clear filtrate. Again, the amount of DE required varies with harvested cell mass. It can be determined by measuring pelleted cell weight and using the result to calculate a recommended percentage of DE. We also assessed this method’s performance using recommended filters. 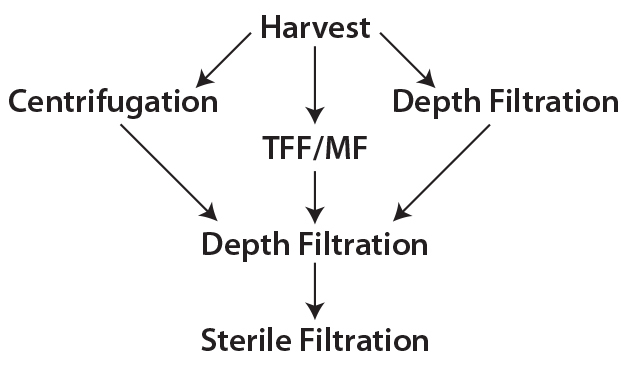 So the different types of single-use clarification technologies we evaluated are as follows: a single depth filter (single-stage clarification), primary and secondary depth filters (two-stage clarification), flocculation followed by depth filtration, and DE additive (to enhance filtration efficiency) followed by filtration. Figure 2 shows a comparative profile of all filters tested in phase 1, plotting the correlation of filter performance (capacity) with differential pressure. Table 1 summarizes the values of reduced turbidity and capacity for those filters. And Figures 3A and 3B provide a comprehensive summary of the phase 1 study. We performed two different experiments on filters provided by Pall Life Sciences. In the first experiment, the HPPDH4 depth filter showed a capacity of 47.3 L/m2 and a pooled turbidity of <12 NTU. The second experiment used primary and secondary depth filters SC050PDK5 and SC050PDE2. The main aim of the first-stage filter SC050PDK5, with its wider pore size, is to remove larger particles with a turbidity cutoff of <25 NTU. Its output then goes to the secondary depth filter SC050PDE2 (narrow pore size) to get a final pooled turbidity value of <10. Capacity for the primary filter was 63.6 L/m2; a correct capacity of secondary filter SC050PDE2 could not be determined because of limited output from primary filter. Among the MilliporeSigma filters, those having wider pores (60 HX) showed a capacity of 143 L/m2 with no increase in pressure, whereas the 40 MS filter with intermediate pore size showed a very high capacity of 383 L/m2, and the 20 MS filter with the smallest pores showed a filtration capacity of 315 L/m2, within the allowed pressure limit. Turbidity reduction was acceptable for both the 20 MS and 40 MS units, but the 20 MS filter showed lower pool turbidity than the 40 MS filter. In our DE-based filtration study, we mixed 40% and 50% DE material from Sartorius Stedim to the harvest cell weight. Results suggest that the harvest with 40% DE showed a better capacity and turbidity reduction than the harvest with 50% DE addition. Final turbidity with both harvests was comparable and >10 NTU. Within a set pressure limit, we used a primary depth filter (10SP02A) provided by 3M to generate material for a secondary depth filter (90ZB08A). The first showed a low capacity value of 80 L/m2 and a high turbidity value of 264 NTU; the second, with its tighter pores, showed a better capacity of 130 L/m2 and pooled turbidity of <5 NTU. To select the best-performing filters for our phase 2 study, we considered the capacity, turbidity reduction, and process recovery data from all filters used in the phase 1 study. Two new technologies — from Sartorius Stedim and MilliporeSigma — showed promising results for handling high-density cell culture harvests. 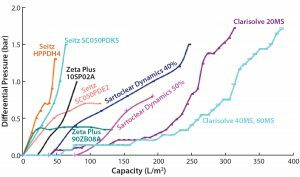 Therefore, we used Sartoclear Dynamics with 40% DE added and Clarisolve 20 MS and 40 MS filters for our phase 2 study (Figures 4A and 4B). At the end of the clarification study, we recovered the filter hold-up by allowing air to push product out of the filter to prevent further dilution. Alternately, hold-up volume can be recovered by flushing a filter by two or three hold-up volumes of buffer. Product recoveries for the selected filters were nearly comparable at ≥95%. Actual recovery of the Seitz HPPDH4 primary filter could not be determined, however, due to clogging of primary filters that occurred during material generation. Overall performance of selected filters in this case was comparable at small scale. But we recommend calculating and optimizing recoveries at pilot scale during scale-up. Pilot-scale batches requires an additional cassette holder, tubings, valves, and connectors — all of which further increases the hold-up volume of filter cassettes. 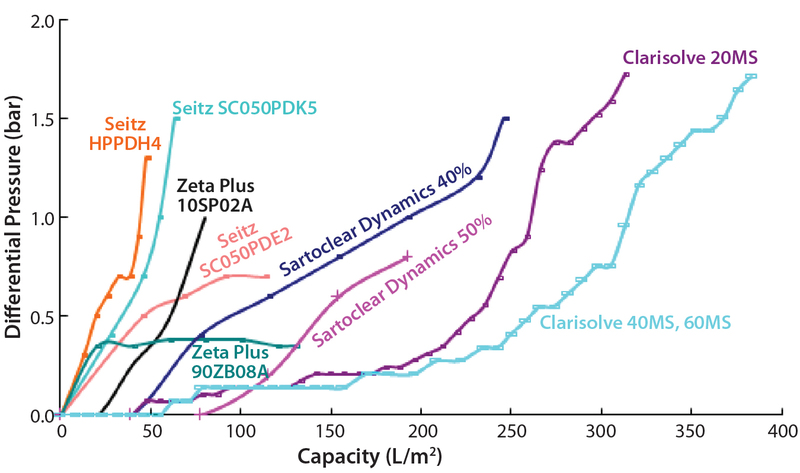 We found the performance of both Clarisolve 20 MS and 40 MS filters to be comparable and better than that of Sartoclear 40% DE. We observed an increased capacity for all three options than what was seen in our phase 1 results, which could be attributed to a decrease in cell density. But turbidity reduction for all filters in phase 2 was comparable and consistent with our phase 1 data. Acoustic wave separation promises to handle very high cell densities from both concentrated fed-batch and perfusion cultures, in which cell density can reach >50 × 106 cells/mL of harvest. We look forward to testing the new Cadence Acoustic Separation (CAS) technology from Pall Corporation as a potential solution to the associated with a very high-density cell cultures. In a CAS system, continuous standing waves retard the flow of cells. As cells increase in number, they aggregate into bigger and bigger clumps. Those experience higher gravitation and cannot remain in the flow, so they settle to the conical end of the system’s flow cells (Figure 5). Multiple acoustic flow-cell chambers in series can further reduce turbidity as required for a given process. This seems to be a good option for cell removal in continuous processing as well as harvest of very high-density cell cultures. However, a secondary depth filter may be required to decrease turbidity further downstream of the CAS system. Several new technologies are available now for clarification and handling high-density cell culture harvests. But no single technique fits all cell culture processes and products. Therefore, it is important to evaluate all available technologies to determine the best clarification solution for an efficient and economical biomanufacturing process. For example, turbidity reduction and filter capacity are important criteria in selection of single-use depth filters for clarification purposes. In our study, Clarisolve filters (20 MS and 40 MS) showed better performance than others tested. However, the choice of clarification technology for any commercial application must be critically evaluated before its implementation in a final process. Pros and cons of each technology and their implications in a given manufacturing process must be understood at laboratory scale — and preferably at pilot scale — before implementing a final choice at commercial manufacturing scale. Furthermore, other factors also should be taken into consideration: e.g., cost of each technology, facility requirements, hardware needs, process scalability and flexibility, vendor support, and regulatory requirements. In our study, we found that the higher-density cell culture could be handled with existing depth filtration techniques to get a desired end product. But an extensive study of available options is the most appropriate way to determine your own needs. The authors are thankful to Ipca Laboratories Ltd. (Mumbai, India) for necessary support. They also give special thanks to Dr. Ashok Kumar (president of Ipca laboratories Ltd.) for his immense motivation and necessary support. 1 Yavorsky D, et al. The Clarification of Bioreactor Cell Culture for Biopharmaceuticals. Pharm. Technol. March 2003: 62–76. Collins M, Levison P. Development of High Performance Integrated and Disposable Clarification Solution for Continuous Bioprocessing. BioProcess Int. 14(6) 2016: S30– S33. Dhanasekharan K, et al. Emerging Technology Trends in Biologics Development: A Contract Development and Manufacturing Perspective. BioProcess Int. 14(9) 2016: 32–37. Gronemeyer P, Ditz R, Strube J. Trends in Upstream and Downstream Process Development for Antibody Manufacturing. Bioengineering 1(4) 2014: 188–212. Le Merdy S. Evolving Clarification Strategies to Meet New Challenges. BioProcess Int. 12(9) 2014: I10–I12. Pegel A, et al. Evaluating Disposable Depth Filtration Platforms for MAb Harvest Clarification. BioProcess Int. 9(9) 2011: 52–54. Tomic S, et al. Complete Clarification Solution for Processing High Cell Culture Harvests. Sep. Purif. Technol. 141, 2015: 269– 275. Manish K. Sharma is senior manager, Snehal Raikar is a research associate, Smriti Srivastava is a junior research associate, and corresponding author Sanjeev K. Gupta is general manager of the advanced biotech laboratory at Ipca Laboratories, Ltd. in Mumbai, India; +91-22-6210-5820; sanjeev.gupta@ipca.com; www.ipca.com.